The Indian Space Research Organisation ( ) is the primary body for space research under the control of the Government of India, and one of the leading space research organisations in the world. It was established in its modern form in 1969 as a result of coordinated efforts initiated earlier. Under the guidance of a number of scientists, ISRO has conducted a variety of operations—supported by its launch vehicle fleet—for both Indian and foreign clients. ISRO has several field installations as assets, and cooperates with the international community as a part of several bilateral and multilateral agreements. Modern space research in India is most visibly traced to the activities of scientist S.K. Mitra who conducted a series of experiments leading to the sounding of the ionosphere by application of ground based radio methods in 1920's Calcutta . Later, Indian scientists like C.V. Raman and Meghnad Saha contributed to scientific principles applicable in space sciences. However, it was the period after 1945 which saw important developments being made in coordinated space research in India. Organized space research in India was spearheaded by two scientists: Vikram Sarabhai—founder of the Physical Research Laboratory at Ahmedabad —and Homi Bhabha, who had played a role in the establishment of the Tata Institute of Fundamental Research in 1945. Initial experiments in space sciences included the study of cosmic radiation, high altitude and airborne testing of instruments, deep underground experimentation at the Kolar mines—one of the deepest mining sites in the world — and studies of the upper atmosphere. Studies were carried out at research laboratories, universities, and independent locations. Government support became visible by 1950 when the Department of Atomic Energy was founded with Homi Bhabha as secretary. The Department of Atomic Energy provided funding for space research throughout India. Tests on the Earth's magnetic field—studied in India since the establishment of the observatory at Colaba in 1823—and aspects of meteorology continued to yield valuable information and in 1954, Uttar Pradesh state observatory was established at the foothills of the Himalayas . The Rangpur Observatory was set up in 1957 at Osmania University, Hyderabad . Both these facilities enjoyed the technical support and scientific cooperation of the United States of America . Space research was further encouraged by the technically inclined prime minister of India—Jawaharlal Nehru. In 1957, the Soviet Union successfully launched the Sputnik and opened up possibilities for the rest of the world to conduct a space launch. The Indian National Committee for Space Research (INCOSPAR) was found in 1962 with Vikram Sarabhai as its chairman. Beginning in the 1960s, close ties with the Soviet Union enabled ISRO rapidly to develop the Indian space program and advance nuclear power in India even after the first nuclear test explosion by India on May 18, 1974 at Pokhran . The death of Homi Bhabha in an air crash on January 24, 1966 came as a blow to the Indian space program. 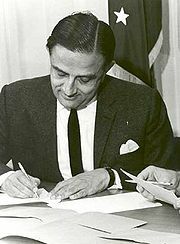 Following Bhabha's passing, Sarabhai was sent to assume Bhabha's place as the chairman of the Atomic Energy Commission and secretary of the Department of Atomic Energy. The 1960s also saw the founding of the Space Science and Technology Centre (SSTC), Experimental Satellite Communication Earth Station (ESCES, 1967), the Sriharikota base, and the Indian Satellite System Project (ISSP). The Indian Space Research Organization in its modern form was created by Vikarm Sarabhai in 1969. This body was to take control of all space activities in the Republic of India. Geopolitical and economic considerations during the 1960s and 1970s compelled India to initiate its own launch vehicle program. During the first phase (1960s-1970s) the country successfully developed a sounding rockets program, and by the 1980s, research had yielded the Satellite Launch Vehicle-3 and the more advanced Augmented Satellite Launch Vehicle (ASLV), complete with operational supporting infrastructure. ISRO further applied its energies to the advancement of launch vehicle technology resulting in the creation of Polar Satellite Launch Vehicle (PSLV) and Geosynchronous Satellite Launch Vehicle (GSLV) technologies. The Satellite Launch Vehicle, usually known by its abbreviation SLV or SLV-3 was a 4-stage solid-fuel light launcher. It was intended to reach a height of 500 km and carry a payload of 40 kg. Its first launch took place in 1979 with 2 more in each subsequent year, and the final launch in 1983. Only two of its four test flights were successful. The Augmented Satellite Launch Vehicle, usually known by its abbreviation ASLV was a 5-stage solid propellant rocket with the capability of placing a 150 kg satellite into LEO. This project was started by the ISRO during the early 1980s to develop technologies needed for a payload to be placed into a geostationary orbit. Its design was based on Satellite Launch Vehicle. The first launch test was held in 1987, and after that 3 others followed in 1988, 1992 and 1994, out of which only 2 were successful, before it was decommissioned. The Polar Satellite Launch Vehicle, usually known by its abbreviation PSLV, is an expendable launch system developed to allow India to launch its Indian Remote Sensing (IRS) satellites into sun synchronous orbits, a service that was, until the advent of the PSLV, commercially viable only from Russia . PSLV can also launch small satellites into geostationary transfer orbit (GTO). The reliability and versatility of the PSLV is proven by the fact that it has launched 30 spacecraft (14 Indian and 16 from other countries) into a variety of orbits so far. In April 2008, it successfully launched 10 satellites at once, breaking a world record held by Russia. The Geosynchronous Satellite Launch Vehicle, usually known by its abbreviation GSLV, is an expendable launch system developed to enable India to launch its INSAT-type satellites into geostationary orbit and to make India less dependent on foreign rockets. At present, it is ISRO's heaviest satellite launch vehicle and is capable of putting a total payload of up to 5 tons to Low Earth Orbit. The last GSLV launch on September 2, 2007 successfully placed INSAT-4CR in the geosynchronous transfer orbit. The Geosynchronous Satellite Launch Vehicle Mark-III is a launch vehicle currently under development by the Indian Space Research Organization. It is intended to launch heavy satellites into geostationary orbit, and will allow India to become less dependent on foreign rockets for heavy lifting. The rocket is the technological successor to the GSLV, however is not derived from its predecessor. The maiden flight is scheduled to take place in 2010. India's first satellite, the Aryabhata, was launched by the Soviets in 1975. This was followed by the Rohini series of experimental satellites which were built and launched indigenously. At present, ISRO operates a large number of earth observation satellites. INSAT (Indian National Satellite System) is a series of multipurpose geostationary satellites launched by ISRO to satisfy the telecommunications, broadcasting, meteorology and search-and-rescue needs of India. Commissioned in 1983, INSAT is the largest domestic communication system in the Asia-Pacific Region. It is a joint venture of the Department of Space, Department of Telecommunications, India Meteorological Department, All India Radio and Doordarshan. The overall coordination and management of INSAT system rests with the Secretary-level INSAT Coordination Committee. Indian Remote Sensing satellites (IRS) are a series of earth observation satellites, built, launched and maintained by ISRO. The IRS series provides remote sensing services to the country. The Indian Remote Sensing Satellite system is the largest constellation of remote sensing satellites for civilian use in operation today in the world. All the satellites are placed in polar sun-synchronous orbit and provide data in a variety of spatial, spectral and temporal resolutions to enable several programs to be undertaken relevant to national development. Oceansat are a series of satellites to primarily study ocean, part of IRS Series. IRS P4 is also known as Oceansat-1, was launched on 27 May, 1999. On 23 September, 2009 Oceansat-2 was launched. ISRO has also launched a set of experimental geostationary satellites known as the GSAT series. Kalpana-1, ISRO's first dedicated meteorological satellite, was launched by the Polar Satellite Launch Vehicle on September 12, 2002. The satellite was originally known as MetSat-1. In February 2003 it was renamed to Kalpana-1 by the then Indian Prime Minister Atal Bihari Vajpayee in memory of Kalpana Chawla – a NASA astronaut who perished in Space Shuttle Columbia. India's first mission beyond Earth's orbit was Chandrayaan-1, a lunar spacecraft which successfully entered the lunar orbit on November 8, 2008. ISRO plans to follow up Chandrayaan-1 with Chandrayaan-2 and unmanned missions to Mars and Near-Earth objects such as asteroids and comets. Chandrayaan-1 (Sanskrit: चंद्रयान-१) is India's first mission to the moon. The unmanned lunar exploration mission includes a lunar orbiter and an impactor called the Moon Impact Probe. India launched the spacecraft using a modified version of the PSLV C11 on 22 October 2008 from Satish Dhawan Space Centre, Sriharikota. The vehicle was successfully inserted into lunar orbit on 8 November 2008. It carries high-resolution remote sensing equipment for visible, near infrared, and soft and hard X-ray frequencies. Over its two-year operational period, it is intended to survey the lunar surface to produce a complete map of its chemical characteristics and 3-dimensional topography. The polar regions are of special interest, as they might contain ice. The lunar mission carries five ISRO payloads and six payloads from other international space agencies including NASA , ESA , and the Bulgarian Aerospace Agency, which were carried free of cost. The Chandrayaan-1 along with NASA's LRO played a major role in discovering the existence of water on the moon. The Indian Space Research Organisation had begun preparations for a mission to Mars and had received seed money of Rs10 crore from the government.The space agency was looking at launch opportunities between 2013 and 2015. The space agency would use its Geosynchronous Satellite Launch Vehicle (GSLV) to put the satellite in orbit and was considering using ion-thrusters, liquid engines or nuclear power to propel it further towards Mars. The Mars mission studies had already been completed and that space scientists were trying to collect scientific proposals and scientific objectives. The Indian Space Research Organization has been sanctioned a budget of Rs. 12,400 crore for its human spaceflight program. According to the Space Commission which passed the budget, an unmanned flight will be launched in 2013-2014 and manned mission likely to launch by 2014-2015. If realized in the stated time-frame, India will become only the fourth nation, after the USSR , USA and China , to successfully carry out manned missions indigenously. The Space Capsule Recovery Experiment (SCRE or more commonly SRE or SRE-1) is an experimental Indian spacecraft which was launched using the PSLV C7 rocket, along with three other satellites. It remained in orbit for 12 days before re-entering the Earth's atmosphere and splashing down into the Bay of Bengal. The SRE-1 was designed to demonstrate the capability to recover an orbiting space capsule, and the technology for performing experiments in the microgravity conditions of an orbiting platform. It was also intended to test thermal protection, navigation, guidance, control, deceleration and flotation systems, as well as study hypersonic aero-thermodynamics, management of communication blackouts, and recovery operations. ISRO also plans to launch SRE-2 and SRE-3 in the near future to test advanced re-entry technology for future manned missions. ISRO will set up an astronaut training centre in Bangalore by 2012 to prepare personnel for flights onboard the crewed vehicle. The centre will use water simulation to train the selected astronauts in rescue and recovery operations and survival in zero gravity, and will undertake studies of the radiation environment of space. ISRO will build centrifuges to prepare astronauts for the acceleration phase of the mission. It also plans to build a new launchpad to meet the target of launching a manned space mission by 2015. This would be the third launchpad at the Satish Dhawan Space Centre, Sriharikota. The Indian Space Research Organisation (ISRO) is working towards a maiden manned Indian space mission vehicle that can carry three astronauts for seven days in a near earth orbit. The Indian manned spacecraft temporarily named as Orbital Vehicle intend to be the basis of indigenous Indian human spaceflight program. The capsule will be designed to carry three people, and a planned upgraded version will be equipped with a rendezvous and docking capability. In its maiden manned mission, ISRO's largely autonomous 3-ton capsule will orbit the Earth at 248 miles (400 km) in altitude for up to seven days with a two-person crew on board. The crew vehicle would launch atop of ISRO's GSLV Mk II, currently under development. The GSLV Mk II features an indigenously developed cryogenic upper-stage engine. Cosmic rays and high energy astronomy using both ground based as well as balloon borne experiments/studies such as neutron/meson monitors, Geiger Muller particle detector/counters etc. Ionospheric research using ground based radio propagation techniques such as ionosonde, VLF/HF/VHF radio probing, a chain of magnetometer stations etc. Upper atmospheric research using ground based optical techniques such as Dobson spectrometers for measurement of total ozone content, air glow photometers etc. Indian astronomers have been carrying out major investigations using a number of ground based optical and radio telescopes with varying sophistication. With the advent of the Indian space program, emphasis was laid on indigenous, self-reliant and state-of-the-art development of technology for immediate practical applications in the fields of space science research activities in the country. There is a national balloon launching facility at Hyderabad jointly supported by TIFR and ISRO. This facility has been extensively used for carrying out research in high energy (i.e., x- and gamma ray) astronomy, IR astronomy, middle atmospheric trace constituents including CFCs & aerosols, ionisation, electric conductivity and electric fields. The flux of secondary particles and X-ray and gamma-rays of atmospheric origin produced by the interaction of the cosmic rays is very low. This low background, in the presence of which one has to detect the feeble signal from cosmic sources is a major advantage in conducting hard X-ray observations from India. The second advantage is that many bright sources like Cyg X-1, Crab Nebula, Scorpius X-1 and Galactic Centre sources are observable from Hyderabad due to their favourable declination. With these considerations, an X-Ray astronomy group was formed at TIFR in 1967 and development of an instrument with an orientable X-Ray telescope for hard X-Ray observations was undertaken. The first balloon flight with the new instrument was made on 28, April 1968 in which observations of Scorpius X-1 were successfully carried out. In a succession of balloon flights made with this instrument between 1968 and 1974 a number of binary X-ray sources including Scorpious X-1, Cyg X-1, Her X-1 etc. and the diffuse cosmic X-ray background were studied. Many new and astrophysically important results were obtained from these observations. One of most important achievements of ISRO in this field was the discovery of three species of bacteria in the upper stratosphere at an altitude of between 20–40 km. The bacteria, highly resistant to ultra-violet radiation, are not found elsewhere on Earth, leading to speculation on whether they are extraterrestrial in origin. These three bacteria can be considered to be extremophiles. Until then, the upper stratosphere was believed to be inhospitable because of the high doses of Ultra-violet radiation. The bacteria were named as Bacillus isronensis in recognition of ISRO's contribution in the balloon experiments, which led to its discovery, Bacillus aryabhata after India's celebrated ancient astronomer Aryabhata and Janibacter Hoylei after the distinguished Astrophysicist Fred Hoyle. ISRO's headquarters is located at Antariksh Bhavan in Bangalore . Physical Research Laboratory Ahmedabad Solar planetary physics, infrared astronomy, geo-cosmo physics, plasma physics, astrophysics, archaeology, and hydrology are some of the branches of study at this institute. An observatory at Udaipur also falls under the control of this institution. Semi-Conductor Laboratory Chandigarh Research & Development in the field of semiconductor technology, micro-electromechanical systems and process technologies relating to semiconductor processing. National Atmospheric Research Laboratory Chittoor The NARL carries out fundamental and applied research in Atmospheric and Space Sciences. Raman Research Institute Bangalore RRI carries out research in selected areas of physics, such as astrophysics and astronomy. Space Applications Centre Ahmedabad The SAC deals with the various aspects of practical use of space technology. Among the fields of research at the SAC are geodesy, satellite based telecommunications, surveying, remote sensing, meteorology, environment monitoring etc. The SEC additionally operates the Delhi Earth Station. Liquid Propulsion Systems Centre Bangalore, Thiruvanthapuram, and Mahendragiri The LPSC handles testing and implementation of liquid propulsion control packages and helps develop engines for launch vehicles and satellites. The testing is largely conducted at Mahendragiri. The LPSC also constructs precision transducers. ISRO Satellite Centre Bangalore The venue of eight successful spacecraft projects is also one of the main satellite technology bases of ISRO. The facility serves as a venue for implementing indigenous spacecrafts in India. The satellites Ayrabhata, Bhaskara, APPLE, and IRS-1A were constructed at this site, and the IRS and INSAT satellite series are presently under development here. "Space Research", Science and Technology in India edited by R.K. Suri and Kalapana Rajaram, 414. Satish Dhawan Space Centre Andhra Pradesh With multiple sub-sites the Sriharikota island facility acts as a launching site for India's satellites. The Sriharikota facility is also the main launch base for India's sounding rockets. The centre is also home to India's largest Solid Propellant Space Booster Plant (SPROB) and houses the Static Test and Evaluation Complex (STEX). Vikram Sarabhai Space Centre Thiruvanthapuram The largest ISRO base is also the main technical centre and the venue of development of the SLV-3, ASLV, and PSLV series. The base supports India's Thumba Equatorial Rocket Launching Station and the Rohini Sounding Rocket program. This facility is also developing the GSLV series.India in Space", Science & Technology edited by N.N. Ojha, 142. Thumba Equatorial Rocket Launching Station Thumba TERLS is used to launch sounding rockets. Indian Deep Space Network Bangalore This network receives, processes, archives and distributes the spacecraft health data and payload data in real time. It can track and monitor satellites up to very large distances, even beyond the Moon. National Remote Sensing Agency Hyderabad The NRSA applies remote sensing to manage natural resources and study aerial surveying. With centres at Balanagar and Shadnagar it also has training facilities at Dehradun in form of the Indian Institute of Remote Sensing. Indian Space Research Organisation Telemetry, Tracking and Command Network Bangalore (headquarters) and a number of ground stations throughout India and World. Software development, ground operations, Tracking Telemetry and Command (TTC), and support is provided by this institution. ISTRAC has Tracking stations throughout the country and all over the world in Port Louis (Mauritius ), Bearslake (Russia ), Biak (Indonesia ) and Brunei . Master Control Facility Hassan ; Bhopal Geostationary satellite orbit raising, payload testing, and in-orbit operations are performed at this facility. The MCF has earth stations and Satellite Control Centre (SCC) for controlling satellites. A second MCF-like facility named 'MCF-B' is being constructed at Bhopal. "Space Research", Science and Technology in India edited by R.K. Suri and Kalapana Rajaram, 416. Indian Institute of Space Science and Technology Thiruvananthapuram The institute offers undergraduate and graduate courses in avionics and aerospace engineering. Indian Institute of Astrophysics Bangalore IIA is a premier institute devoted to research in astronomy, astrophysics and related physics. Development and Educational Communication Unit Ahmedabad The centre works for education, research, and training, mainly in conjunction with the INSAT program. The main activities carried out at DECU include GRAMSAT and EDUSAT projects. The Training and Development Communication Channel (TDCC) also falls under the operational control of the DECU. "Space Research", Science and Technology in India edited by R.K. Suri and Kalapana Rajaram, 415. Antrix Corporation Bangalore The marketing agency under government control markets ISRO's hardware, manpower, and software. A model of the Geosynchronous Satellite Launch Vehicle III. ISRO plans to launch a number of new-generation Earth Observation Satellites in the near future. It will also undertake the development of new launch vehicles and spacecraft. ISRO has stated that it will send unmanned missions to Mars and Near-Earth Objects. Following the success of Chandrayaan-1, the country's first moon mission, ISRO is planning a series of further lunar missions in the next decade, including a manned mission which is stated to take place in 2020 – approximately the same time as the China National Space Administration (CNSA) manned lunar mission and NASA 's Project Constellation plans to return to the moon with its Orion-Altair project. Chandrayaan-2 (Sanskrit: चंद्रयान-२) is the second unmanned lunar exploration mission proposed by ISRO at a projected cost of Rs. 425 crore (US$ 90 million). The mission includes a lunar orbiter as well as a lander/rover. The wheeled rover will move on the lunar surface and pick up soil or rock samples for on-site chemical analysis. The data will be sent to Earth via the orbiter. ISRO plans to carry out an unmanned mission to Mars in this decade. According to ISRO, the Mars mission remains at a conceptual stage but is expected to be finalised shortly. The current version of India's geo-synchronous satellite launch vehicle will be used to loft the new craft into space. ISRO is designing a solar probe named Aditya. This is a mini-satellite designed to study the coupling between the sun and the earth. It is planned to be launched in 2012. The Indian Regional Navigational Satellite System (IRNSS) is an autonomous regional satellite navigation system being developed by Indian Space Research Organisation which would be under total control of Indian government. The requirement of such a navigation system is driven by the fact that access to Global Navigation Satellite Systems like GPS are not guaranteed in hostile situations. ISRO plans to launch the constellation of satellites between 2010 and 2012. ISRO is currently developing two new-generation launch vehicles, the GSLV-Mk III and the AVATAR RLV. These launch vehicles will increase ISRO's present launch capability and provide India with a greater share of the global satellite launch market. Institutions like the Indira Gandhi National Open University (IGNOU) and the Indian Institute of Technology use satellites for scholarly applications. Between 1975 and 1976, India conducted its largest sociological program using space technology, reaching 2400 villages through video programming in local languages aimed at educational development via ATS-6 technology developed by NASA. This experiment—named Satellite Instructional Television Experiment (SITE)—conducted large scale video broadcasts resulting in significant improvement in rural education. ISRO has applied its technology to "telemedicine", directly connecting patients in rural areas to medical professionals in urban locations via satellites. Since high-quality healthcare is not universally available in some of the remote areas of India, the patients in remote areas are diagnosed and analyzed by doctors in urban centres in real time via video conferencing. The patient is then advised medicine and treatment. The patient is then treated by the staff at one of the 'super-specialty hospitals' under instructions from the doctor. Mobile telemedicine vans are also deployed to visit locations in far-flung areas and provide diagnosis and support to patients. ISRO has also helped implement India's Biodiversity Information System, completed in October 2002. Nirupa Sen details the program: "Based on intensive field sampling and mapping using satellite remote sensing and geospatial modelling tools, maps have been made of vegetation cover on a 1 : 250,000 scale. This has been put together in a web-enabled database which links gene-level information of plant species with spatial information in a BIOSPEC database of the ecological hot spot regions, namely northeastern India, Western Ghats, Western Himalayas and Andaman and Nicobar Islands . This has been made possible with collaboration between the Department of Biotechnology and ISRO." The Indian IRS-P5 (CARTOSAT-1) was equipped with high-resolution panchromatic equipment to enable it for cartographic purposes. IRS-P5 (CARTOSAT-1) was followed by a more advanced model named IRS-P6 developed also for agricultural applications. The CARTOSAT-2 project, equipped with single panchromatic camera which supported scene-specific on-spot images, succeed the CARTOSAT-1 project. ISRO has had the benefit of International cooperation since inception. Establishment of TERLS , conduct of SITE & STEP, launches of Aryabhata, Bhaskara, APPLE, IRS-IA and IRS-IB/ satellites, manned space mission, etc. involved international cooperation. ISRO operates LUT/MCC under the international COSPAS/SARSAT Programme for Search and Rescue. India has established a Center for Space Science and Technology Education in Asia and the Pacific (CSSTE-AP) that is sponsored by the United Nations. India hosted the Second UN-ESCAP Ministerial Conference on Space Applications for Sustainable Development in Asia and the Pacific in November 1999. India is a member of the United Nations Committee on the Peaceful Uses of Outer Space, Cospas-Sarsat, International Astronautical Federation, Committee on Space Research (COSPAR), Inter-Agency Space Debris Coordination Committee (IADC), International Space University , and the Committee on Earth Observation Satellite (CEOS). "Space Research", Science and Technology in India edited by R.K. Suri and Kalapana Rajaram, 447. Chandrayaan-1 carried scientific payloads from NASA , ESA and the Bulgarian Space Agency. The Russian Space Agency is cooperating with India in developing the rover for Chandrayaan-2 and also in the Indian manned mission. ISRO and the Department of Space have signed formal Memorandum of Understanding agreements with a number of foreign political entities. India carries out joint operations with foreign space agencies, such as the Indo-French Megha-Tropiques Mission. On 25 June 2002 India and the European Union agreed to bilateral cooperation in the field of science and technology. A joint EU-India group of scholars was formed on 23 November, 2001 to further promote joint research and development. India holds observer status at CERN while a joint India-EU Software Education and Development Center is due at Bangalore . Rakesh Sharma Born: January 13, 1949 On April 3, 1984, Rakesh Sharma along with Gennady Strekalov and Yury Malyshev successfully docked with the Salyut 7 station abroad the Soviet Soyuz T-11. "U.S. and Russian Human Space Flights: 1961–September 30, 1999", NASA , Government of the United States of America. Rakesh Sharma became the first Indian citizen to travel into space, and was awarded the Soviet honor Hero of Soviet Union and the Indian Ashoka Chakra for this mission. "Sqn Ldr Rakesh Sharma", National Defence Academy, Government of India. Raja Ramanna Born: 1925 - Deceased: September 23, 2004 Raja Ramanna served as the director of the Bhaba Atomic Research Centre (1972–78 and 1981–83); Director-General, DRDO; secretary for defense research, Government of India (1978-81); chairman of the Atomic Energy Commission between 1984–87; director of the National Institute of Advanced Studies, Bangalore; minister of state for defense in the Indian cabinet between January–November 1990; member of the Rajya Sabha between August 1997–August 2003; and as a member of the India's first National Security Advisory Board. Abdul Kalam Born: October 15, 1931 A.P.J. Abdul Kalam contributed significantly to the Indian nuclear program, the Indian space program, and several defense projects. He served as the director of the SLV-3 project. After serving successfully with the ISRO Kalam moved on to the DRDO where he served as the director. In the DRDO he was in charge of the development of several missiles including the Nag, Prithvi, Akash, Trishul, and Agni series. He was chosen as the eleventh President of India, serving from 2002 to 2007. U.R. Rao Born: March 10, 1932 From 1972 onwards Rao oversaw the development of over 15 satellite projects in India, including the Aryabhata, APPLE, Rohini, INSAT, and Indian Remote Sensing satellite. He served as the chairman of the governing council of the Physical Research Laboratory, Ahmedabad; as chairman, Space Commission; and as secretary, Department of Space. He contributed significantly to the ASLV, PSLV, and the GSLV series. Rao also helped develop cryogenic technology and apply space technology to practical uses in India. K. Kasturirangan Born: 20 October, 1940 Kasturirangan held several key posts in the Indian space program and served in the Rajya Sabha from August 27, 2003 onwards. His important contributions included the Polar Satellite Launch Vehicle (PSLV) program, Geosynchronous Satellite Launch Vehicles (GSLV) series, and the Indian Remote Sensing satellite (IRS) satellite series during his tenure as the head of the Indian space program from March 1994 to August 2003.Current Science (2004), 86 (7): 895-896, Bangalore: Indian Academy of Sciences. G. Madhavan Nair Born: October 31, 1943 Chairman of ISRO during 2003 – 2009, secretary to the Indian Department of Space, and the chairman of the Antrix Corporation, Bangalore . K. N. Shankara Born: 7 May, 1945 Shankara served as the director of ISRO's Space Applications Centre (SAC), Ahmedabad during 2002-2005 and ISRO Satellite Centre (ISAC), Bangalore during 2005-2008, and was awarded PadmaShri in the year 2004. Mylswamy Annadurai Born: 2 July, 1958 Annadurai served as the director of the successful Chandrayan moon mission. He had previously served in the IRS-1A, IRS 1B, INSAT 2A, INSAT 2B, and EDUSAT projects. K. Radhakrishnan Born: August 29, 1949 Incumbent chairman of ISRO, former director of Vikram Sarabhai Space Centre, Trivandrum . Khan, Sultanat Aisha (2006), "Russia, relations with", Encyclopedia of India (vol. 3) edited by Stanley Wolpert, 419-422, Thomson Gale: ISBN 0-684-31352-9. Hennock etc. (2008), "The Real Space Race Is In Asia", Newsweek. Ketkar, Prafulla (2006), "European Union, Relations with (Science and technology)", Encyclopedia of India (vol. 2), edited by Stanley Wolpert, 48-51, Thomson Gale: ISBN 0-684-31351-0. "Raja Ramanna", Vigyan Prasar, Department of Science and Technology, Government of India. "Avul Pakir Jainulabdeen Abdul Kalam", Vigyan Prasar, Department of Science and Technology, Government of India. "IAA Attributes the Von Karman Award for 2005 to Prof. Udipi Ramachandra Rao (India)", International Academy of Astronautics, October, 2005. "K. Kasturirangan ", ISRO, Government of India. Mohapatra, Satyen (2007), "Reaching for the moon", Hindustan Times. Bhaskaranarayana etc. (2007), "Applications of space communication", Current Science, 93 (12): 1737-1746, Bangalore: Indian Academy of Sciences. Burleson, D. (2005), "India", Space Programs Outside the United States: All Exploration and Research Efforts, Country by Country, pp. 136-146, United States of America: McFarland & Company, ISBN 0-7864-1852-4. Daniel, R.R. (1992), "Space Science in India", Indian Journal of History of Science, 27 (4): 485-499, New Delhi: Indian National Science Academy. Gupta, S.C. etc. (2007), "Evolution of Indian launch vehicle technologies", Current Science, 93 (12): 1697-1714, Bangalore: Indian Academy of Sciences. "India in Space", Science & Technology edited by N.N. Ojha, pp. 110-143, New Delhi: Chronicle Books. Mistry, Dinshaw (2006), "Space Program", Encyclopedia of India (vol. 4) edited by Stanley Wolpert, pp. 93-95, Thomson Gale, ISBN 0684313537. Narasimha, R. (2002), "Satish Dhawan", Current Science, 82 (2): 222-225, Bangalore: Indian Academy of Sciences. Sen, Nirupa (2003), "Indian success stories in use of Space tools for social development", Current Science, 84 (4): 489-490, Bangalore: Indian Academy of Sciences. "Space Research", Science and Technology in India edited by R.K. Suri and Kalapana Rajaram, pp. 411-448, New Delhi: Spectrum, ISBN 8179302946. Article on India's space program. About India's space program, launch Vehicles,Chandrayaan.